I’m in my room now, about to sleep. These past few days have been really hot. It’s really irritating and uncomfortable. 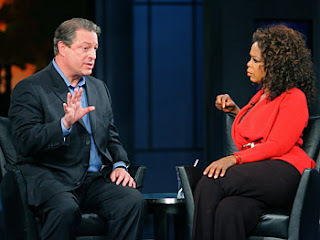 Anyway, I’ve seen an episode earlier in Oprah about global warming that is really frightening. Former US Vice-President Al Gore had shown visuals that would erase parts of the world because of the high level of seawater from melted ice. My friend a week or two has been bugging me to check a site about global warming and requested if I could post it in my blog. I wasn’t that aware that I told him that people knew about it already. I was wrong. The US government should do something about it since they are the number one source of pollutants. If the US government would start doing something, definitely other countries would follow. Compact fluorescent light bulbs: These energy-efficient bulbs cost less than $4 and are produced by major corporations like GE. If every household in America switched five regular light bulbs for five fluorescent bulbs, it would be the equivalent of taking 1 million cars off the highways for a full year. Outdoor solar lighting: These yard or patio lights cost less than $20, and they don't burn any electricity or produce any CO2. Programmable thermostats: Though these thermostats cost from $50 to $100, they can actually cut your heating and cooling costs. Set the setting so it's a little bit cooler in the winter and warmer in the summer when you're not in the house. A difference of 2 degrees can reduce a home's CO2 emissions by up to 9 percent over the course of a year. Air filters: Changing the air filters in your heating and cooling systems regularly can knock 2 percent off of your CO2 output each year. Electric hot water heater blanket: Hot water heaters use a lot of energy and generate a lot of CO2. A blanket costs less than $18 and can cut your home's CO2 emissions by almost 4 1/2 percent. I hope it’s not too late for the future. Good night!